Many people don’t like treadmill running. I have a number of friends & clients who claim they hate the treadmill and will go to almost any length to avoid them. However, as winter approaches, the days get shorter and outside conditions get worse, running on a treadmill provides a safe and convenient alternative from the worst of winter. I find treadmill training fits very nicely into my training during winter months when I’m pressed for time or it’s either early in the morning or later in the evening. In the following video and below, I describe some treadmill workouts I use and recommend to runners whom I coach. Before you start any of these workouts, I recommend that you complete a brief warm-up of lunges and leg swings. Click the link to see a video where I show how to properly conduct this simple, yet important warm-up routine. Once complete, begin each workout with approximately 10 minutes on the treadmill as discussed below. The first workout is a beginner’s stamina workout. I recommend that you start here if you’re just beginning your training plan or if you don’t have much experience on a treadmill. The duration of this workout is 20 minutes. You can increase it to 30 minutes by adding 10 minutes to stressful running. a) Next set the incline to 1% and keep it at this incline for the duration of the workout. 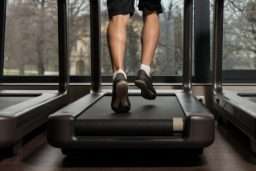 b) Increase the speed of the treadmill to 6.5, 7.0 or 7.5. Keep it at this speed for 2:30. If you can’t keep up with the fast speed you’ve set, then try a speed .3-.5 less, just make sure you are breathing hard (but not labored). d) After 2 ½ minutes at the lower speed, go ahead and increase the speed back up to where you were before for another 2 ½ minutes. You should now be at 17.5 minutes total and have completed 1 ½ circuits alternating hard/medium effort with 1% incline. e) Finish your workout with 2 ½ – 5 minutes at your comfortable pace and 0% incline. 2) To increase the duration of this workout, simply continue rotating hard, then medium paced intervals for 2 ½ minutes each while keeping the incline at 1%. 3) To add variation to this workout, you can increase the incline by 1% for each hard/medium circuit. 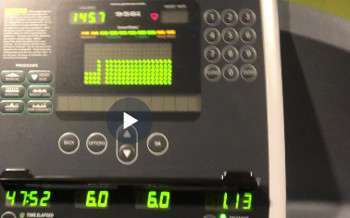 You’ll notice that it really starts to get hard when you exceed 5% incline. The second workout is for speed. You’re not going to have any incline, so you’ll keep it at 0%. The focus is on speed. Time to complete this workout is 25 minutes. a) Next increase the speed of the treadmill to 8 or 9 or whatever really fast pace you can handle for 30 seconds. b) After 30 seconds decrease speed to 4.5 or 5.5. Whichever is slightly comfortable, but allows you to recover for 1 minute. c) Next increase back up to your really fast speed for 30 seconds. e) Finish with 6 minutes at comfortable/jogging pace. The third workout is like a pyramid. We’re going to steadily increase the incline throughout the workout. This is a tough workout, so I recommend that you’re able to complete the 1st two treadmill workouts before you attempt this one. 1) After completing lunges, leg swings and a 10 minute warm-up, run at a steady pace (5-7 depending on your ability) for 1 minute each @ 4, 5 and 6% incline. After 3 minutes, bring the incline back down to 2% and complete a 2 ½ minute recovery jog at 4-6 pace. 2) After the 1st set, complete the next part of the pyramid by running for 1 minute each at 5,6 and then 7% incline. After 3 minutes, complete recovery jog as before for 2 ½ minutes. 4) Finish the workout with 5 minute recovery jog (added to the 2 ½ minutes for total of 7 minutes of recovery. If you’re interested in purchasing your own treadmill, you may be wondering which one is best. I think it really depends on your needs, budget, space available and how much you intend to use the machine. The people at reviews.com recently reached out to me and told me how they spent six weeks testing and evaluating 65 treadmills currently available. They consulted with various experts and ultimately compiled four stand out recommendations: best for walkers, training, runners, and best entertainment features. Their findings have been published. Click here to get details. 1) Short Intervals (repeats) – following are 3 different workouts that can be combined in any way to make a longer workout. I would only combine the workouts, if can’t access the track or marked trails due to weather. These workouts are short (time it takes to complete), so they’re perfect for busy people. The longer intervals will do a great job at building your stamina. a) 10-15 minute warm up at an easy pace (5 – 6) – start with 10 x 1 minute at “ON” or 5-10K pace, then 1 minute at “OFF” (very easy) to add difficulty, increase to 15 x 1 minute intervals – finish with 10 minute cool down at an easy pace (5 – 6). b) 10-15 minute warm up at an easy pace (5 – 6) – start with 8 x 400m or 1/4 mile at 5-10K pace with 400m or 1/4 mile at easy pace to add difficulty, add 4 more 400m for total of 12 – finish with 10 minute cool down at an easy pace (5 – 6). c) 10-15 minute warm up at an easy pace (5 – 6) – start with 2 sets of 1 minute fast (half marathon pace) then 1 minute faster (10K pace) then 1 minute fastest (5K pace) with 1 minute between intervals and 3 minutes between sets to add difficulty, add 1 more set – finish with 10 minute cool down at an easy pace (5 – 6). 2) 34 Minute Ladder Workout – another short workout to build stamina. I like this workout because you get to spend time at various race paces. It’s a great workout for when you’re pressed for time. b) Complete alternating “hard/easy” intervals for total of 6 minutes as follows.